New nuclear energy technology has come a long way – but can we get over our fears? This is the fifth episode of Climate Lab, a six-part series produced by the University of California in partnership with Vox. Hosted by Emmy-nominated conservation scientist Dr. M. Sanjayan, the videos explore the surprising elements of our lives that contribute to climate change and the groundbreaking work being done to fight back. Featuring conversations with experts, scientists, thought leaders and activists, the series takes what can seem like an overwhelming problem and breaks it down into manageable parts: from clean energy to food waste, religion to smartphones. Sanjayan is an alum of UC Santa Cruz and a Visiting Researcher at UCLA. 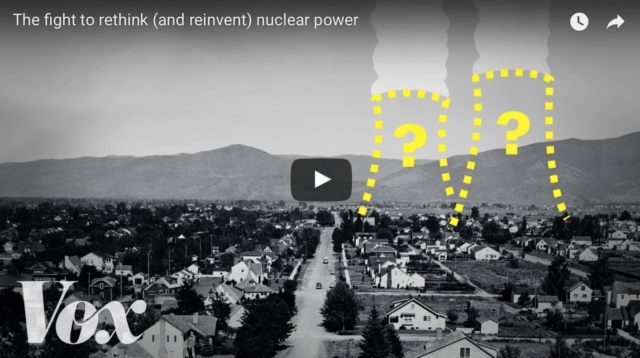 Watch the nuclear explainer below, and prior episodes here. “When you think of the word nuclear, what comes to mind? It’s probably some terrifying thought. I can’t blame anyone for being nervous. It’s a technology that we’ve been using for decades that can really reduce global warming, but it’s not exactly something environmentalists are that excited about. “The first thing many people think of is nuclear war and mushroom clouds. You add into that major events like Three Mile Island and Chernobyl and now most recently Fukushima, and those have had incredibly profound consequences on people’s immediate feelings and images and associations with this technology. “This isn’t something where the public has the view wrong. It is a technology with a reputation that’s been earned.